Posted December 3, 2018 by greendog & filed under Amazing Things You're Not Buying, behavioral tip, dental health cats and dogs, Products We Love. Many people know that catnip can create a euphoric and playful feelings in many cats, but other cats don’t seem to be affected. There are actually several other plants that could create this same effect, especially one called silver vine, which is in the kiwi family. Interestingly, a recent study shows that more cats reacted to silver vine than to catnip, and moreover, almost 75 percent of the catnip non-responders responded to silver vine. 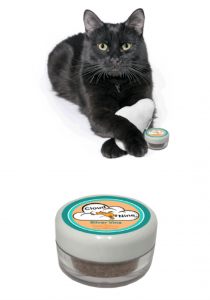 If your cat hasn’t enjoyed catnip, or even if he loves catnip, you should really give silver vine a try. Our cat Otis likes catnip OK, and mostly wants to lick it, but Silver vine really holds his interest, and even stimulates him to play with soft toys on his own when it’s applied to them (which is unusual for him, as he prefers interactive play). 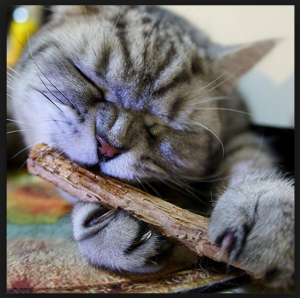 He also loves rubbing his face on the ends of the sticks when we hold them for him, and many cats like to chew on them, perhaps adding a dental health benefit. The effects for Otis seem strongest when he doesn’t smell it every day. Every few days we pull out the sticks or a silver vine sprinkled toy and it’s all new again. We’ve brought in products from From The Field including a locally made silver vine/catnip blend in small “dime bags” to try, and in 1oz containers for those that want more. We also have a multi-pack of sticks from the same Washington company, nested in dried silver vine leaf, and a also cloud shaped soft toy that comes with a little tin of finely ground silver vine from Dezi Roo that you can sprinkle onto it and other toys. Happy playtime, kitties! They also have a good article about Why Silver Vine Is Better Than Catnip. Offering cats novel objects and smells are key to keeping them happy and behaviorally healthy. Experiment with Silver Vine to see if it can add some spice to their lives!